Goichi "Suda51" Suda is arguably one of Japan's most famous game developers, and has been behind some of the most unique and compelling Japanese games of the past few decades, including Killer7, The Silver Case and - of course - No More Heroes. This franchise - along with its mouthy hero Travis Touchdown - has perhaps become Suda's most renowned work, and has a long and proud connection with Nintendo; the first game made its debut on the Wii, as did the sequel. Travis is returning to his roots in Travis Strikes Again: No More Heroes on the Nintendo Switch, and we were lucky enough to sit down with Suda at EGX Rezzed last week to chat about the title. Nintendo Life: Why did you choose Nintendo Switch as your platform? Travis has a history of being on Nintendo systems, so did that affect your decision to focus so entirely on Switch? Suda51: With the No More Heroes series, it just feels like it should always be on a Nintendo platform, it’s just the way it is. When the Wii U came out a lot of fans were clamouring for another instalment on the Wii U, but the timing wasn’t right. But then when I saw the Switch hardware, instincts sort of hit me, like, “this is where I need to bring Travis back”. The game obviously takes place inside a virtual world, what made you go for that angle rather than another game in the No More Heroes real world? First thing is that this isn’t a numbered sequel to No More Heroes, it’s Travis Strikes Again. It’s a new title which signifies we’re going for a new kind of challenge. So up until now Travis has fought assassins, and this time he’s going inside the game world and fighting in there. Another reason behind this is that we started development with an indie-sized team, only four people. Now it’s grown to fifteen people, so it’s given us the freedom to make a completely new kind of game. We’ve noticed you’ve done everything to take advantage of the Nintendo Switch’s hardware, is there anything else that we haven’t yet seen that uses the Switch’s unique capabilities? We’re actually still thinking about what else we could put in the game, and we’re hoping to base it off a lot of user feedback from these events, so we’re listening to what people want, what they don’t want, and we’re hoping to use that to make the game even better. The game is incredibly self-aware, partly because it’s a game within a game, but No More Heroes has a habit of breaking the fourth wall and making references to other popular media. How important do you feel these elements are to the game? One part of the process is that whilst we’re creating the game staff members will often suggest new ideas and references, and if it’s good enough we’ll put it in. I write all the text, and as a special thank you to everyone who takes the time to play the game, I want to put something special in there that will make them happy. Despite coming from Japan, a lot of the references we’ve seen in No More Heroes are of Western culture and media. Was it a challenge to include these as opposed to Japanese references that perhaps you’re more familiar with? Actually, there have been lots of foreign influences coming into Japan since I was a child, perhaps even more so now. But when I was a child I really feel I learnt about the wider world through watching pro wrestling. They would show wrestling from all over, and that really taught me a lot about the world. When I grew up and became a high schooler, I got really into UK music, particularly music from Manchester. That was another big step in which I learnt more about foreign culture. I don’t really feel like I’m pushing myself to bring in elements from other cultures, I’m just bringing in what I like and taking inspiration from that. We noticed when playing that motion controls are required to recharge the players’ weapons. Is there an alternative or is it too important a part of the overall game experience? We’re still working on various elements of the game, but I’m pretty confident that we’re not going to have an option to switch the motion controls off. We really want to utilise the Switch hardware as much as possible in any way we can. I’m confident we can make the motion controls smooth enough so that even those that aren’t fans of it will be able to at least accept it. You’ve said yourself that you’ve moved down to a smaller team. Has that brought about any challenges in terms of creating the game you envisioned? So obviously the limited personnel is a big challenge, because when you’ve got a big idea you’ve actually got to change it little by little to make it possible to achieve, and this is a daily process. You can’t just add new staff and hope that gets things done, you just have to work with the people you have and see what you can do based on that. To round things off, is this the last we’ll see of Travis or does he have an exciting future ahead of him? 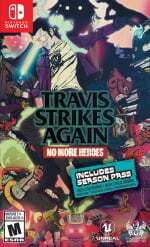 Our wish right now is that should Travis Strikes Again be successful, it’ll allow us to create actual numbered sequels in the No More Heroes series, so to answer your question we want Travis to go on for many more years. Please let this game hit the charts because Suda51 is one of those very rare passionate developers out there and if he sees potential - he makes the game. From the sounds of it if he grows this team into something big then he will have the freedom to bring any franchises he wants wherever he sees fit. 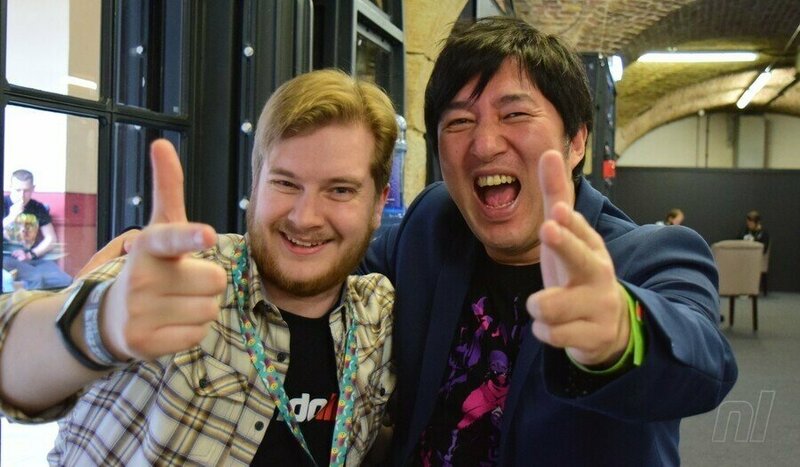 Support his work and don't shake it off as "another indie" if you want to see No More Heroes brought back in the same epic format as the Wii titles onto the Switch. A sequel to this iconic franchise is something everybody should encourage. I still don´t know why so much people are waiting for games of Suda51. Never found any of there games appealing. Typical Japanese weird stuff for special tastes. I will buy the crap out of this and would not even mind to have a Switch port of both Wii titles. No More Heroes just combines a ton of my passions into a single product and Suda is one hell of a guy. Always makes me sad his games don't sell trough the roof. Loved NMH 1&2 on the Wii. Didn't like NMH2 when I played it for an hour on my Wii U (havent tried NMH1 yet). But I really like what I'm seeing gameplay-wise on TSA. Will buy it for sure. I see so this is just a No More Heroes spin off type deal. I dig it. I'll defo be looking into this. If the sales lead to an exclusive to Switch - No More Heroes 3!!! I'm in. Why am I getting a "Travis Touchdown for Smash" kinda vibe? @EasyDaRon Maybe because so much people (count me in) like weird japanese stuff? @EasyDaRon "typical Japanese weird stuff for special tastes"
Yes, and I guess your taste isn't that special. Sometimes one finger is enough. I got to give this a check later, I played through NMH2 a long time ago, while these aren't my kind of games, there's just something about it that prevents me from disliking it, between the excellent voice acting, fluid controls, and that one fever dream stage where you play as Henry, damn. Also a good chunk of the game is playing as Shinobu which is a great addition since Shinobu's a badass. In any case it's not easy to make a repetitive beat 'em up/hack n slash game good, and this game gets it. It seems strange to me that everyone is celebrating this guy like a huge celebrity when in fact he hasn't created a single big game so far. Guys like Miyamoto, Aounuma, Molyneux, Spector and others are gamedev celebrities for a reason, they created masterpieces that will live on as evergreens, they deserve to be excessively celebrated and adored. But certainly not some random indie dev from Japan known only for a few mediocre or decent games? @shani Killer7 - Part of the "Capcom 5" initiative to bring exclusive IP to Gamecube. NMH - One of the greatest tongue-in-cheek franchises of the modern gaming era, with motion controls that didn't feel like mindless waggle, except when it was supposed to. Lollipop Chainsaw - May not have been a great game by any means, but it was a collab with James Gunn, whom you may know as the director of a certain big movie or 2. Shadows Of The Damned - another fantastic collab with Japanese greats Shinji Mikami and Akira Yamaoka. Those are just a few, but each one of those was filled with so much passion and STYLE!, I'd say a man like Suda is worth celebrating. This guy should work with Platinum to make a NMH that would take advantage of their technical expertise while using his design ideas. Something like Nier Automata. Shame about the motion controls, I'm really not a fan of them personally and it puts me off buying a game. Still, I will likely get this regardless. "When I grew up and became a high schooler, I got really into UK music, particularly music from Manchester"
I have never played any games in the No More Heroes series so this will be a fun journey for me when I eventually get the game. @EasyDaRon Same reason people like Rhythm Heaven, WarioWare, GalGun, or Parodius, I suppose. @EasyDaRon that's exactly it. You dont understand why we like them, but you know what it is we like. It's just not for you. I'm not sure how I feel about this game, I really want it to be fun. I was originally expecting no more heroes and now I'm looking at a game that resembles Furi? Hmm, I'm crossing my fingers for something good. Well I'll certainly be doing my part. I have really enjoyed the No More Heroes franchise so far. Probably a day one game for me. If supporting this means getting a true NMH 3, I'm down...I loved the first two games even with the motion controls because they were implemented just right. This game looks so naff! @EasyDaRon Seems like you answered your own question. Cant wait for this. NMH1 and 2 are excellent fun, and Killer 7 was, well, an "eye opening" experience. I dont even know why im using quotes. But that game definitely did something to my eyes.